Temporary track of 5.7 km in a rural setting. Boxes with capacity of 32 riders. Not available lighting for night racing. Tested with the Mods: Megane, 1970WSC y BAC Mono. I was almost 3 weeks without internet and bored me a bit, so I took everything that had of 3D models and textures by the computer and sometimes I was doing until I gave it terminated. Thanks to R Soul for landscape. nocturnas. Testeado con los Mods: Megane, 1970WSC y BAC Mono. Estuve casi 3 semanas sin internet y me aburría un poco, así que cogí todo lo que tenia de modelos 3D y texturas por el ordenador y a ratos fuí haciendo hasta que lo dí por terminado. Gracias a R Soul por su paisaje de fondo. 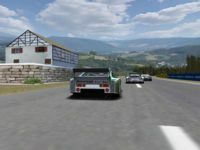 There are currently no setups for ABADIA Road 1994. Add a Setup. Quisiera saber si me puedes explicar como se hacen las pistas que tipo de Software tengo que usar y los pasos para ver si logro hacer alguna como esta que esta espectacular. thank you very much for this nice track! Could you give me the permission for the publishing of my F1 Challenge 99-02 conversion of this track on my FB page and on the Wookey's forum, please? Me ha gustado el ambiente años ´90 que les has querido dar, sobre todo en la zona de la recta de meta, con sus carpas en boxes y los camiones con su publicidad. Un trazado bastante fluido, con algunos puntos interesantes para apurar frenada, y un escenario bonito. Me encanta ver el saltito de los rivales en el puente antes de meta mientras conduzco, ya sea el que llevo delante, como el que llevo detrás, aparte de visionar las repeticiones desde las cámaras estáticas que has colocado por el circuito. Thanks for the comments, again.The truth is that I got to do tests with fog, using the parameters of Nordschleife and Eschdorf Wet; the first was a very bad result, but the second gave him a winter look incredible, but in both cases increased the consumption of FPS and in my opinion not enjoyed the scenery. For me, the most important thing has always been that everyone can enjoy the circuits that I do even if you have a modest computer, because they are prepared for that, depending on the settings of "circuit details" appear or not some objects (trees, public, vehicles, etc.) which are not important, so that anyone can try them, or that I would like. but it already has a fantastic look. Great work, the AI racing line is stop on, a lot of track makers tend to have the AI's drive around the track in the center of the track, with no hint of a proper racing line DTMShanghai2010 is the worst I've found up to now, which makes racing against AI's difficult. Thanks for the comments. I guess that the transition between mountains and sky is not perfect because I have not done so well or because the texture is static and changing the position of the Sun there is no changes in its lighting and shading. The issue of crossings: you're right, the transitions of ground are not my strong point and did not want my complicated life. have you tried monitoring by cameras? When you just want to drive fast on public roads in a nice landscape, this is the track to go for. It has a uncomplicated layout and looks good. The landscape images in the background look good but the transition from the mountains to the sky is a little bit strange on some places. I wonder, why are there almost no crossroads on a lot of fantasy tracks which try to look like real life road tracks?